With the famed abdication of Tsar Nicholas II on the fateful day of March 15, 1917, Russia experienced a drastic paradigm shift in the manner of political atmosphere and public perception of the socioeconomic status quo that had previously prevailed for centuries. The Tsar relinquishes his omnipotence as the autocratic ruler of the state with a charismatic speech venerating “the destinies of Russia, the honour of her heroic Army, the happiness of the people, and the whole future of our beloved country”1. His declaration is a notion of nationalism; an appeal to the people to lead the country onto a noble path of wealth and power so that it may become transfigured into a prosperous utopia freed from the “obstinate war”2 that had so dreadfully plagued the nation. The culmination of the speech is veiled with a sense of desperation and subservience to fate, as it ends with a single note of hope encompassed within the phrase: “May God help Russia”3. The cataclysmic prostration of the autocracy before its own people is further exemplified by the refusal of the Tsar’s heir, Grand Duke Mikhail, to take over the throne. He states that he is “firmly resolved to accept the Supreme Power only if this should be the desire of our great people”4 and acknowledges the pressing need for implementing political change and widespread popular suffrage. This thus allowed for the bold entry of the First Provisional Government, also known as the Temporary Committee of the State Duma. 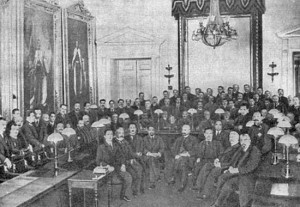 The first provisional government set the stage for what would be known in the future as democratization and an attempt to establish popular sovereignty. The doctrines that it placed forth and advocated were interwoven with liberalism and bordered upon the early principles of communism, and included the desire to “abolish all restrictions based on class, religion, and nationality” as well as “an immediate and complete amnesty in all cases of a political and religious nature”5. This legislation envisioned a blissful yet unrealistic system that consisted of sharp implementation of the fundamental rights to freedom of speech, press, and assembly, while simultaneously embodying peace. The framework of ideologies that the Duma mapped out was much to feeble to counter the strain of the political perturbation the nation underwent in such a short period of time. The Duma eventually failed in its quest to craft an immense revolution and to enforce each and every one of its progressive reforms, yet also allowed for an eruption of a new form of government that would be capable of embodying the true radical spirit of change: the Bolsheviks of 1917. This entry was posted in HIST254-Archive and tagged Abdication, Duma, First Provisional Government, Russia, Soviet, Tsar Nicholas II by ashley. Bookmark the permalink. You state your points eloquently, and with a vibrant usage of vocabulary. Remember, though, to always use the past tense when discussing history; you slipped into the present tense in the second half of the first paragraph. That being said, you have a really strong thesis statement in your first sentence; however, you do not seem to make explicit connections back to that thesis. While the “political atmosphere” is more easily inferred, could you perhaps elaborate more on the “public perception of the socioeconomic status quo” changes that occurred at this time? Lastly, two more things, you do not need “manner of” in your thesis statement. Also, you should probably make an explicit connection to which war Tsar Nicholas II referred to: World War I, even though it was not called that at the time.